For some people, growing your net worth by $5,000 per month might seem crazy. For others, it might seem normal. 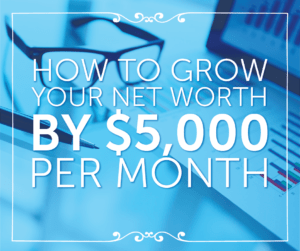 Growing your net worth by $5,000 per month means seeing your net worth rise by $60,000 per year. That sounds like a lot, but if you’re looking to retire and live comfortable in the future, you need to be pacing at this level. It might seem daunting to grow your net worth by $5,000 per month if you’re focused on doing it through saving alone. You probably can’t – because there is a limit to how much you can save each month. But if you focus on growing your net worth through a combination of saving, earning more, and leveraging passive income through investing, you can easily make and start exceeding $5,000 per month. Most people start growing their net worth by saving, so let’s start here. This won’t get you very far in your long term goals, but everyone needs to save. If you want to save $5,000 per month, think about what your income and expenses are and start saving the difference. Honestly, if you want to reach this $5,000 mark, you’ll likely need to be earning around $10,000 per month. To supplement your straight savings, you need to consider earning more money. Unlike simply saving (which has a finite limit), the amount of extra money you can earn is limitless. Just think – if you could earn an extra $5,000 per month, you could simply save it and you’d be hitting your goals. But $5,000 extra per month is not easy. If you’re going to start a side hustle< or work a second job, it’s going to require time and effort. But it is possible. If you need some inspiration, check out this list of 50+ Ways To Get Started Earning A Side Income. The best way to grow your net worth by $5,000 per month is to develop passive income streams. We’ve talked about how to make $50,000 per year in passive income, and the rules are the same regardless of the amount. The goal is that you take some of your extra money (either savings or extra income) and invest it in something that will earn you passive income. For example, you could invest in dividend paying stocks, or invest in real estate. We’re bullish on real estate and love the new products like RealtyMogul and Fundrise that allow investors to take advantage of real estate investments for low minimums. For most of us, we’re going to grow out net worth through a combination of the above tactics, which makes hitting our goals easier. Instead of needing to save $5,000 per month, what if you only needed to cut $1,000 from your budget? You could then focus on earning $3,000 extra and building your passive income to $1,000 extra per month. Now, that starts to become much more achievable. Saving $1,000 in your budget is possible, and many bloggers have shown us how. Earning an extra $3,000 is totally possible. Just last week my Uber driver was telling me how she made $3,000 per month driving – and she was a teacher for her day job. Everything she made driving was just extra income. Then, it just comes down to generating $1,000 per month in passive income. That’s also very possible. You can take advantage of investments, real estate, savings, residual income, and more. If you have $300,000 in investable assets, earning a 4% return will realize you $1,000 per month. Now, $300,000 may seem like a lot, but there are millennials that have already achieved this. 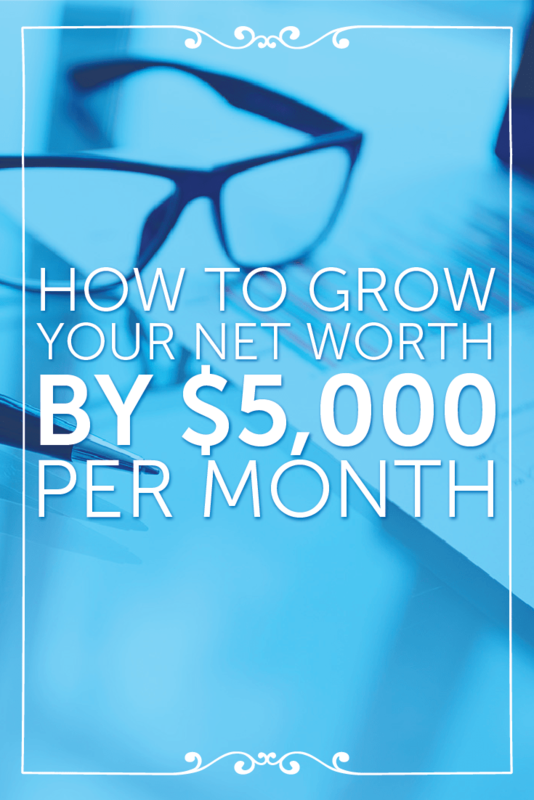 The most important thing to remember is that you don’t start growing your net worth by $5,000 per month overnight. You start by growing it by $1, then $10, then $100, and keep moving forward. You save and invest each month. You pay down any debt you have. You are focused on earning more and growing your income streams. Since it takes time, you have to track it. If you’re not already using a system to track your net worth, we recommend Personal Capital. It’s a free online app that allows you to connect all your accounts and will track your income and expenses, and net worth for you. Then, you can really start to know what you’re net worth is. Do you track your net worth? What’s your favorite way to increase your net worth or do you like doing a combination of these strategies. Here’s the thing bud: While I know it’s not easy to set money aside and invest in myself so I can be a more fulfilled me in the future, because I only earn so much now, I can’t help but envision myself one day owning hundreds of acres of land and living a very comfortable life. My problem is like the underpants gnome equation. I know what I have to do, and I know where I want to end up, but I don’t know how to make the moves to get there. And all the friendly advice or tips in the world won’t change my marketable skill set, or financial prowess. There’s got to be a way to turn 20k into 7 mil in ten years that’s honest and legal. It takes a combination of effort, like the article says. Save money each month – just commit to it. Then, earn more. There are tons of ways to earn more – and you can likely find something to match your skills if you are creative about it. Finally, invest the difference and allow your money to work for you. $20k to $7m is not a likely scenario within 10 years, but if you can commit and find $5k per month, and invest it every month at 8%, you’ll be close to $1m within 10 years. Even if you can only commit $500 per month, at 8%, it will grow to almost $140k within 10 years. Robert, how could Invest with no money available. You have to start somewhere – try $100. I’m a believer that anyone can earn $100 more per month if they work at it. With that, you can get started investing with $100. Any advice on getting into dividen stock? I absolutely loath the stock market and would rather have what a relative has, someone who does the investing for them and takes a precent of the profit, but even that service aside most places I have looked at want a laughably high starting investment (high for me, that is). You should look into a RoboAdvisor such as WealthFront or Betterment if you want it automated for you. They take a small management fee, but it’s all taken care of. A 401k is only one of many options. You can look into opening an IRA and start investing there. Here’s our guide on how to start saving for retirement. Look at the section 3 about saving when you’re a freelancer or entrepreneur.